If you’ve never worn a pair of swimming goggles before, then the process of selecting the best ones can be a very frustrating experience. You’ve got to be able to know what to look for in the best swimming goggles so that you don’t waste your money on a pair that aren’t designed as well as they could be. If you’re ready to protect your eyes from the pool water, the lake water, or you just want to have a pair on hand for the kids, then here is the information you’re going to want so you can choose the best swimming goggles possible. Swimming goggles come in all different colors, shapes, and sizes. Some even attach to the head differently than others. To find the best goggles possible, you’ll need some information about each pair so you can get a pair that meet your needs. That’s what the chart below provides. What Are the Best Swimming Goggle Basics? There are three basic tests that anyone can perform on their swimming goggles to make sure that they are the high quality goggles that are needed. Are they comfortable? Don’t wrap the straps around your head. Just push the lenses of the goggles into your eyes as if you were wearing them. This will let you know if they’ll work for your face shape. Without comfort, you’re not going to want to wear them for the time required in the pool. Look for foam rubber or silicone padding for eye socket comfort and a bridge design that won’t dig into your nose. Do the swimming goggles stick? The best swimming goggles are going to create a temporary seal around your eyes when they’re pressed into your face. After pressing them in to see if they’ll be comfortable, release the goggles to see if they stick in place for a few seconds. If they do, then you’ll have a leak-free experience in the water. If not, you’ll want to look for a different pair. Put the straps on. If you feel like your preferred goggles have passed the first two tests, then wear them for real. Put the straps on and see if they’re still comfortable. Do the goggles pull at your eyes? Is the strap digging into the back of your head? If not, then you’ve got the best goggles for swimming. The best swimming goggles can come at any price point. As long as they fit your face and create a good seal, you won’t have to worry about having water leak into your eyes during a swim. What Are the Benefits of the Best Swimming Goggles? When you’ve got great swimming goggles, then you’ve got something that will help you see under the water. The pressure of the water, along with the backpressure from the goggle straps, will help to keep the water from entering your eyes. That’s why it is very important to make sure that the straps on your preferred swimming goggles can be easily adjusted. The straps shouldn’t be able to easily detach either. If they do, then you’ll just have frustration waiting for you when you get to the water. Get a good fit and you’ll have a great experience. The type of environment can help with your sight as well. If you have light lenses in your swimming goggles, then you’ll be able to see clearly at an indoor pool. Dark goggles are perfect for an outdoor swim because they act like a pair of sunglasses. Brighter environments typically benefit from darker swimming goggles, but everyone has their own personal preferences. You’ll also want to check on the quality of the anti-fog coating on the swimming goggles to weigh the value of this final benefit. Lenses that have been coated are worth the extra small-added costs because they won’t become fogged as often, even if water does manage to leak into the goggles during a swim for some reason. Fogged up swimming goggles, especially in a pool, can actually create a dangerous situation. That’s why anti-fog lenses provide value. What Are Some Common Problems With Swimming Goggles? Swimming goggles come with plenty of options, features, sizes, and shapes. This means that choosing the best goggles for swimming often just comes down to your own personal preferences. The biggest problem is that comfort is emphasized over practical use. Comfortable swimming goggles are great until they spring a leak in the pool and your eyes burn from the chlorine. Comfort and a good seal are both important. Larger swimming goggles tend to slide off more during activities, like taking a dive off the diving board. Any quick flip turns could also dislodged the larger goggles. Go with smaller ones if you plan on being very active in the pool. Here’s a Salty Dog pro tip: Diving goggles and swimming goggles are not the same thing. You do not want to wear diving goggles in the pool or for a swim out at the local lake. You’ll just wind up having them slip off more often than not. What Are the Prices of the Best Swimming Goggles Today? If you purchase bulk-swimming goggles, then it is possible to pick up a pair for as little as $5. These goggles are very basic and don’t offer many features or a consistent seal, so they are usually considered an emergency backup option. High quality swimming goggles can be found on a website like Amazon for about $20 and will have shatterproof lenses with anti-scratch treatments on them. Premium goggles priced above $50 may create higher levels of durability, but often provide the same overall user experience. These swimming goggles are not only comfortable, but they’re incredibly durable. The anti-scratch coating on the exterior of the lens is really nice and the curved nature of the lens helps to create a more comfortable fit. The lenses are shatterproof as well, so you won’t have to worry about impacts around the eye as you swim. The buckles of these goggles offer micro adjustments and the buckles are interchangeable with all other Cressi products. They even offer some UV protection and the anti-fog treatment works consistently. These are definitely some swimming goggles to consider today. For an affordable pair of swimming goggles, you can beat the mirrored finish that is perfect for competitive swimmers that come with this pair. These goggles really help to minimize the glare that light and water can sometimes produce; yet the expanded side view allows for a swimmer to use their peripheral vision effectively too. It’s a low-profile fit for these goggles, they are latex free, and the rigid frame creates a consistent watertight seal. The nosepiece can even be swapped out for something else to provide a more customized fit. These swimming goggles might be designed for the ladies, but anyone wearing them is going to look and feel fabulous. The design of the lens allows swimmers to enjoy a full 180-degree field of visibility that is free from distortions. The buckle system is incredibly easy to adjust and the Plexisol lenses stay clear whether you’re in the pool or a natural body of water. They offer 100% UVA/UVB protection and the scratch-resistant coating allows these swimming goggles to be a long-term investment. These are one of the best swimming goggles thanks to the soft frame that they have, which allows for an extreme amount of flexibility. It’s a one-piece frame, so it isn’t going to work with all face styles, but the dual silicone strap is incredibly comfortable. The goggles themselves are nice and light and the polycarbonate lenses offer anti-fog features and UV protection. If you’re looking to get a lot of value out of your swimming goggles, then the price point and these features make the Energy series from Finis are ones that must be strongly considered. 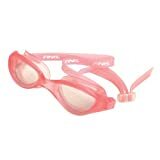 These swimming goggles are designed with the kids in mind. They’re super simple to put on and the easy adjustment system of the buckles will help kids have a leak-resistant pair of goggles that will let them swim for an extended period of time. The goggles are large enough to provide a full view of the water without difficulty while different lens types are available based on a child’s needs and the expected lighting conditions. These are real goggles that will let your children be able to have fun in the water just like you can and they will feel all grown up. The best swimming goggles must do two things: provide consistent vision and be leak-free. Comfort should also be in the equation so the goggles can be worn for an extended period of time. Use these tips and these swimming goggle reviews to find the best pair to meet your needs and then get out on the water and have some fun.